What five year old boy does not love a pirate adventure? As we were perusing our tourist trip books, one of the first musts on Ephraim’s list was the Black Raven Pirate Adventure. 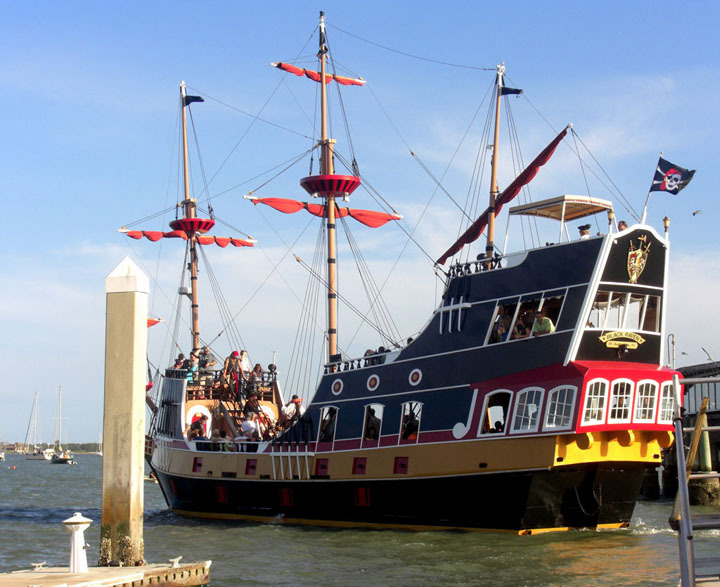 A new attraction to the historic city, this authentic looking pirate ship yields a fun and exciting adventure for pirate lovers of all ages and also provides a nice tour of the St. Augustine waterfront. We opted for the 6:15 departure. We were told to arrive 15 minutes ahead of time for ticketing and boarding. I would encourage you to purchase your tickets ahead of time, as the boat was filled to capacity. Also, make sure you arrive on time, as they leave all late scallywags behind. As we lined up to board the boat, a scruffy looking pirate walked through the line, taking pictures with the kids, pulling pranks on the adults and definitely created an atmosphere of anticipation for the passengers. One thing that really stood out for me was how the pirates didn’t push themselves on to the small children. While Ephraim was eager to give the pirate a large hug, Lu was very frightened of the costumed character. She buried her head half way into my shirt while keeping one eye closely on the pirate. He gave her a quick wave and smile and moved on in the crowd. It was definitely the first encounter that allowed her to open up and enjoy herself later on. Once we boarded the ship, we were asked to find seating around the boat. There are seats along the sides, inside a the covered bar area and in the upper decks. We chose to sit inside because of the sun. Our seats were perfect, right on the edge so we could look out to the staging area. There were several opportunities during the ride to move about the boat and take pictures in the upper decks. The boat also has full bar with snacks and pirate booty to purchase for the kids as well as two excellent bar wenches. My husband went to the bar and got some sodas and purchased Ephraim a pirate head scarf and eye patch for $5.00. Ephraim was thrilled with his costume additions. I will say that if I was to do it over again, I would definitely bring a pirate costume for Ephraim. Several of the other children were predressed in their pirate gear and I wished we had done the same. Once we were through the formalities (life jacket locations and safety talks), which were very humorous as well, the pirates began their show of songs, jokes and magic tricks. The show was very funny although most of the jokes and songs went over my five year olds’ head. Ephraim enjoyed the show but the one thing he he felt was missing was a pirate fight and I have to say that would probably make the show a tad more authentic. The pirates did a really good job of encouraging audience participation. The show was all good natured fun, no pirate attacks or plank walking on this boat. During the 2 hours tour, there were 2 breaks in the show to allow for the pirates to take picture with the everyone. They also provided face painting and necklaces for the children. Overall I would say that the Black Raven Pirate Adventure was a wonderful addition to our typical St. Augustine trip. I would highly recommend it to families with young children looking for something outside the typical ghost tours and walking tours of the old city. any interest in turning this into a guest post for Baby To Go??? sounds really fun!